The Card Grotto: Happy Birthday Sarah! As you can probably tell from the title of the post this card was made for my friend Sarah. I have used LOTV's Thomas with Champagne stamp which I thought looked a little like her beloved cat Bozzy! I have stamped him out and coloured with Copics adding glitter to the champagne using a Spica pen. I have then cut the image out using a Nestabilities circle and added to the base with 3d foam. The base is a sheet of Memory Box Dots Bluebird paper layered with Doodlebug Bubble Blue CS. I have also added a strip of this down the middle and added teeny tiny SU! pearls coloured with a Copic marker. I have punched out MS Monarch Butterflies using Memory Box Gingham Bluebird paper and added Doodlebug jewels in the centres. Sentiment from the Ladybug Crafts Ink Its Only Words 2 set stamped and cut out using a Nestabilities Label die. STAMPS: Lili Of The Valley, Ladybug Crafts Ink. CS: Craftwork Cards, Doodlebug Designs, Memory Box. TOOLS: Nestabilities, Martha Stewart Monarch Butterfly punch, Copic Spica At You glitter pen, Copic Markers - cat: N1, N2, N3, N4, N5, N7, R20; mouse: E53, E55, R20; cork: E42, E43; present: B41, B45; shadow: W00, W1. EMBELLISHMENTS: Doodlebug Designs Mini Jewels, Stampin' Up! pearls. Thank you for visiting today, hope you have a lovely day! 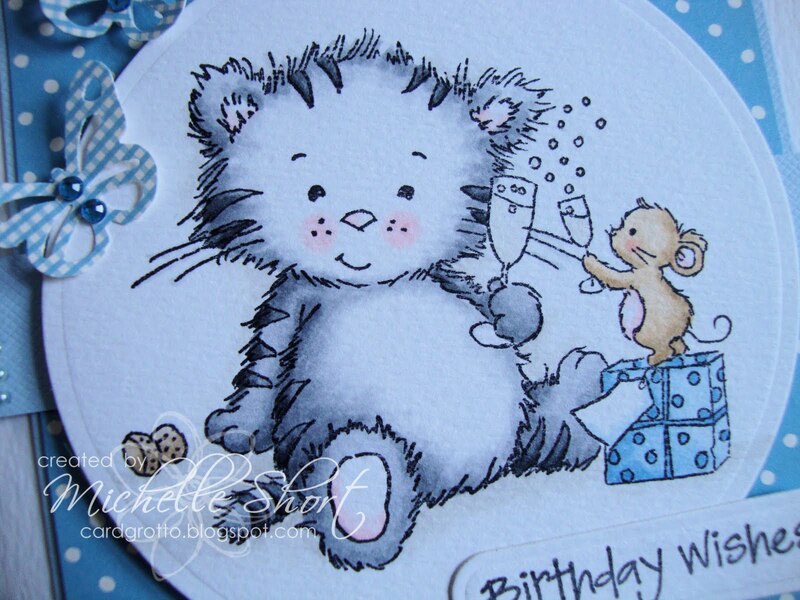 A gorgeous card Michelle and i'm sure that Sarah will love it especially as it has got a cat on there! hola, me gusta mucho tu trabajo y el color especial que les das a tus imágenes, una tarjete bellisima, cariños. Oh Michelle, I ADORE this card! Such a cutie! Ahhhhh, just adorable Michelle! Love the cute image and the sweet butterflies! Thank you so much hun!! It's even better IRL! I love the fact that you've thought about Bozzy, it definitely looks like him!! Gorgeous card. Love your colouring. I have just found your blog and spent a while browsing you have some beautiful cards on here. Love the CAS style that you have as they show the images off perfectly. I will be popping back I'm sure. 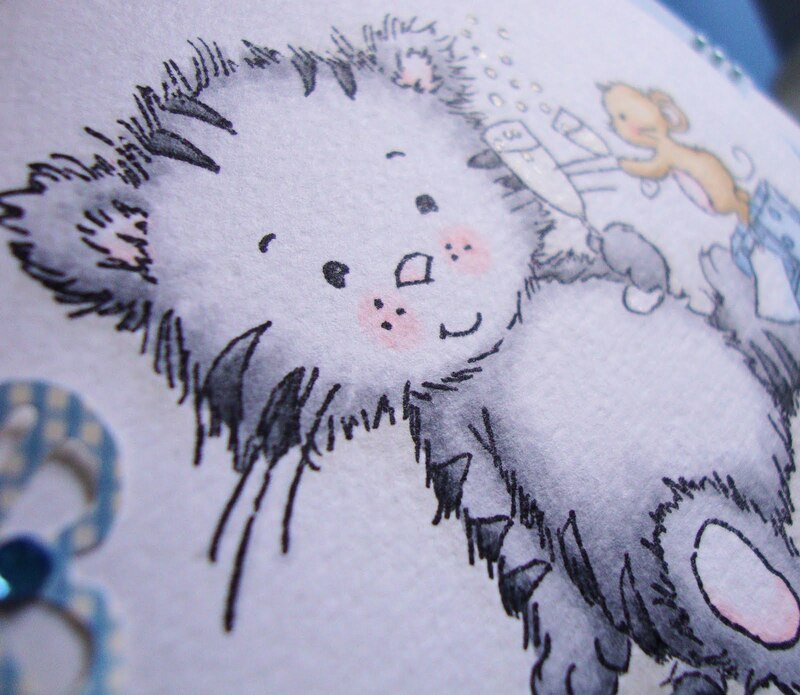 Oh my goodness, cute cute cute card - I love it! 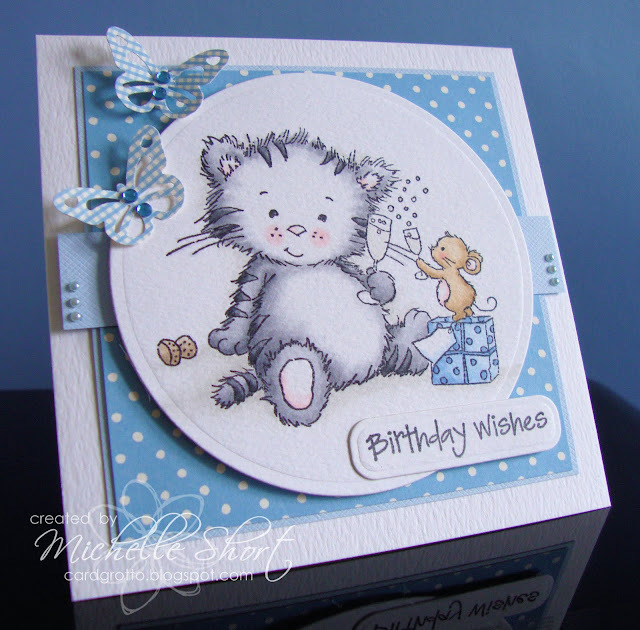 That kitty is adorable and your layout, colours and colouring are amazing - wonderful card!